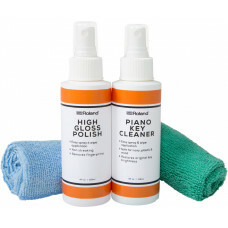 Keep your Roland high-gloss digital piano looking its best with our premium care kit. Includes our special polish, a key cleaner, and two microfiber cleaning cloths. Our own blend of quality ingredients help keep your high-gloss instrument looking new while enhancing its luster. Safely cleans and polishes while leaving a nice mirror finish.